email us at PrismBookTours(at)gmail.com with "The Better Man GF" in the subject line. The Better Man by Amy Vastine! 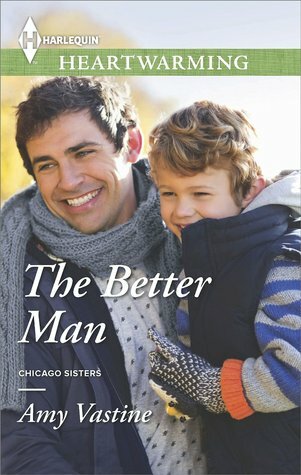 The Better Man, which is the beginning of the new Chicago Sisters Series, is set in the busy city of Chicago, but is full of family, friendship, and love. It's also from the clean romance Heartwarming line of books from Harlequin. Did you miss any of the tour? You still have time to go back and check out all the stops and enter the amazing giveaway! Kendall is facing reality now. She's a very talented and gifted designer and artist and is now able to use those abilities to make a living. Based off of her life experiences and relationships, she's a little gun-shy, with good reason. I loved watching her evolve. Being a mother isn't easy and doing what's best for your kids isn't always easy, either, but, as Kendall learns, the hard things are often the most rewarding. Today I thought I would introduce you to Max, the hero. In my mind, Max always looked like and had similar personality traits as the character Ryan Gosling played in the movie Crazy, Stupid, Love. Easy on the eyes, charisma and charm, and let’s not forget great fashion sense. Max is always well put together and did I mention he often has a five o’clock shadow? I love a guy with a little scruff!.. This story is so sweet! I love the characters, and can't wait to read more books about Kendall's sisters. Amy has definitely become one of my new favorite authors! His father had left. His father had left them both. Kendall gave her mother an apologetic grimace, but Nana was too startled by Simon’s verbosity to notice. “Who? Who did you see?” she asked, crouching down to his level. He handed her the picture he’d drawn. And the twist. Which I refuse to ruin for you. But let me just say, Amy. Well flipping done, my friend. Because you know I love stuff like this. And the way you wove this tale, and took me along for the ride, quite willingly, I might add . . . and revealed everything just the way it was supposed to be revealed, at the exact time it needed to be revealed . . . made me smile so big. I just love the way my heart was happy for (almost) everyone, in the end. The three of them got busy painting and embellishing the costume. Their collective laughter created a lightness Kendall hadn’t felt in a long time. Seeing Simon act like a normal six-year-old freed her from the year’s worth of guilt and worry she’d been carrying around. This wasn’t like having Trevor around. It was better. There are a couple of things about the book that truly stand out as dynamic stylistic characteristics. For one thing, the author switched back and forth between the man’s and women’s perspective. Not all authors have the knack for doing that, but this author does. I also appreciate the fact that the author introduces a child who is grieving the death of his father in a unique way. I found that to be a realistic element that will connect with others who have been in that position. I love books like this that grip you and you don’t want to put them down! (This was a book that did that.) The Better Man seemed to have a different storyline than any other book that I have ever read. It was extremely refreshing to read totally new content. First time ever reading from this author and was completely impressed. Her work is well written and easy to follow. This particular storyline is heart grabbing. I am enjoying this story. Two separate people, each with a child with a need to be parented. “Winner!” Max jumped her last checker and threw his hands up in the air, victorious. “I’m pretty sure you cheated,” Kendall mumbled. “Are you going to give Max kisses because he won?” Simon asked, completely putting an end to their playful argument. “Which one were you again?” Kendall asked, recognizing that Lucy’s guard was down. I really enjoyed this story, it had some really sad and some really happy moments. The characters where what made this book shine, they all had a past, personality and motives, even the side characters. This book has a fun and quirky cast of characters and I enjoyed seeing them interact with each other. The Better Man was quite an original story and one I haven't read before in this genre. The leading man looks almost exactly like the heroine's dead husband and this causes all sort of issues because they have to work together. Sparks definitely fly, both good and bad, but the author kept a great balance between heavier issues (such as Kendall's son who has become mostly mute as a way to deal with his father's death), humor, and then those sweet romantic moments.